I was sad to leave Imabari and the Tokunaga family; it’s always difficult to say goodbye to people who have been so kind. 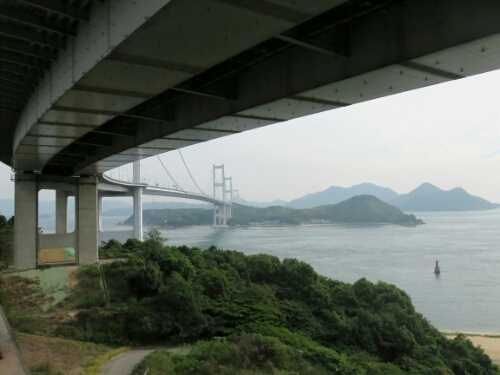 Off I went though, once more I would be crossing the Shimanami Kaido, the series of bridges linking Shikoku and Honshu. 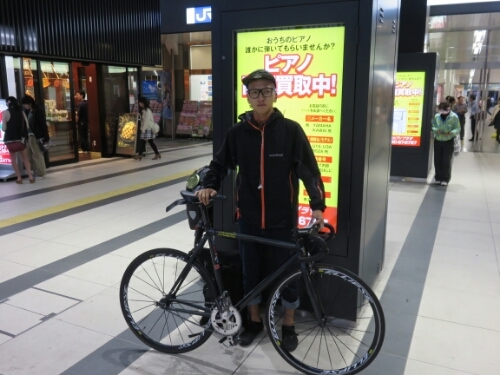 I wanted to get across as fast as possible as another typhoon was coming and I wanted to reach Fukuyama as early as possible so I’d have a better chance of finding a couch surfing host. I’d sent a couple of requests and hoped I’d be accepted. Unfortunately I had one refusal before I’d even left. 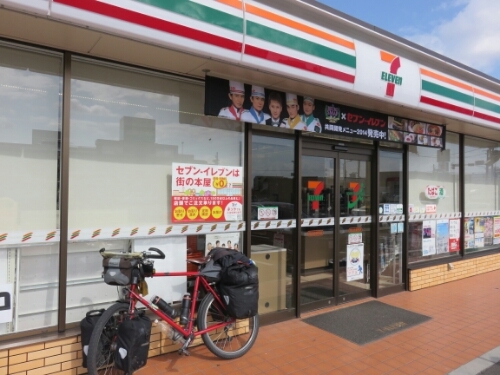 Like the day before, when I’d ridden to Imabari, it was once again quite windy meaning I had to put a lot more effort in to make a pace I was happy with. Thankfully the weather remained clear and as I started in on the bridges of the Shimanami Kaido I was far from the only cyclist doing so. Indeed after about bridge two of seven I’d been caught up by a group of four Japanese riders pounding along on road bikes. 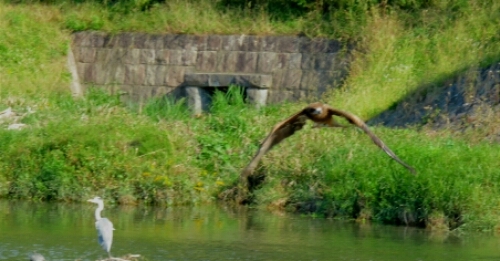 They were going a bit faster than me but not so much faster that I couldn’t tag along in their slipstream. This meant I was now going much quicker, even if it was costing a lot of effort. Eventually we got to chatting as we rode and when they stopped for a break I did too. Clearly deciding they weren’t going to get rid of me they kindly bought me a snack instead and let me join the gang. They were really very nice and riding them made my pace far faster than it otherwise would have been. I thus managed to get into Fukuyama far quicker than I’d expected. Unfortunately when I’d checked my email at a 711 earlier I’d gotten another couch surfing refusal. I now had one hope left for a host. Otherwise it would be Plan B: trying to find somewhere in the station to sleep. I knew I definitely couldn’t risk camping, by all accounts the typhoon was going to be a big one. 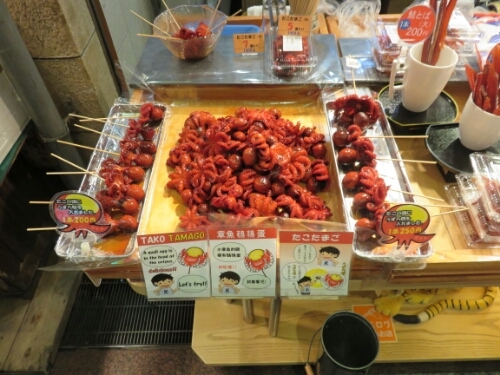 With Plan B in mind I went to Fukuyama station to, as it were, case the joint. Luckily there was a 711 there so I could easily check my email. With that in mind and as it was still early I decided to sit under cover outside the convenience store and wait to see if I got a response. I had plenty of time to find a corner to sleep in. 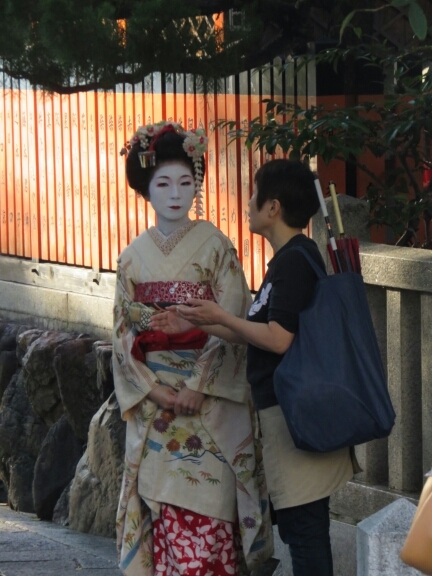 While I was waiting I was approached by a young Japanese guy who seemed genuinely excited to speak to me. He’d just come back from a cycle ride himself and my bike had aroused his curiosity. Our conversation was pretty basic as he had no English and my Japanese isn’t exactly conversational. Still we were communicating and I found out his name was Shoji. Then he suggested I should come and meet some guys at the bike shop he used which was nearby. This seemed a little strange but as I was just passing the time anyway I agreed. The bike shop, it transpired, was very trendy and even had a series of BMX ramps on the second floor. The guys there were very friendly as well and seemed interested in what I was up to. Shoji seemed to be enjoying showing me off. While we were attempting to chat I asked the owner about one of my pedals. It had been making a really awful clicking sound for a while I thought the bearings were gone. I wanted to know if I would be able to get to Tokyo. The mechanic took it off and tinkered away with it for about 45 minutes but concluded it couldn’t be fixed and I’d need a new one. He did say that I should be able to get to Tokyo, which was what I really wanted to know. While we were waiting Shoji had asked where I was going and what I was doing and I’d had to admit that currently I was probably going to be sleeping in the station. This seemed to trouble him and he came back to it a couple of times, muttering it was dangerous. Having slept in Paddington station in London a few times while waiting for the first train I wasn’t too worried about the dangers of Japanese station but didn’t know how to explain. 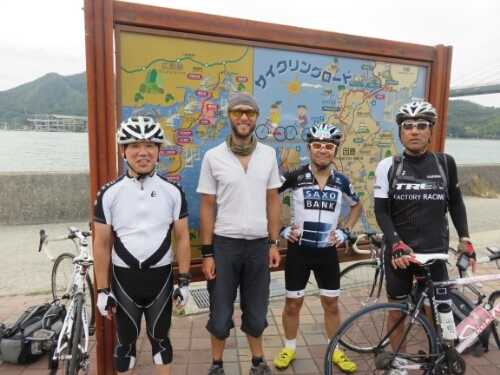 Anyway after they’d finished with my pedal Shoji told me I should stay with him. At this point I wasn’t sure if the couch surfing host had got back to me but, I considered, a bed in the hand is better than one in the bush or station as was more likely so I agreed with much thanks. As we headed back to his we stopped at a 711 so I could check my mail. Still no reply on couch surfing so I cancelled and rode back with Shoji happily. 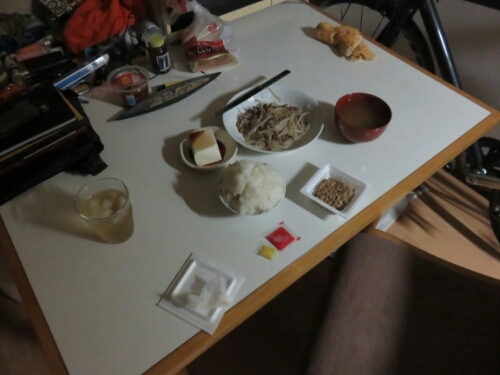 Shoji’s place was very similar to mine when I lived in Japan. They are called 1DKs and are the equivalent of a studio flat in Europe but a bit better. You have one room to live and sleep in and then a dining kitchen area with a separate bathroom and toilet. Shoji kindly set out a piece of floor for me and I felt very happy to be inside and sheltered. Then Shoji went into good host over drive and cooked me a tasty dinner and ran me a bath. This was way more than I would have expected from your average 20 year old. After he was sure I was comfortable he apologised and said he was going to meet friends for skate boarding. I got the impression it would take a lot to make him miss this. I was quite happy as I was pretty exhausted and this would give me a chance to sleep. Almost as soon as he left I was out for the count, fast asleep. It’s lucky I didn’t wait for him to get back before sleeping as he rolled in at past 4am! The next day when I woke the typhoon had begun and heavy rain was falling interspersed with a howling wind. I was really hoping that Shoji wasn’t going to say I had to go when he woke up. It was a while before I found out as he slept into the afternoon. I needn’t have worried, when he woke up he seemed fine with me staying another night. By the following morning the typhoon was expected to have finished. 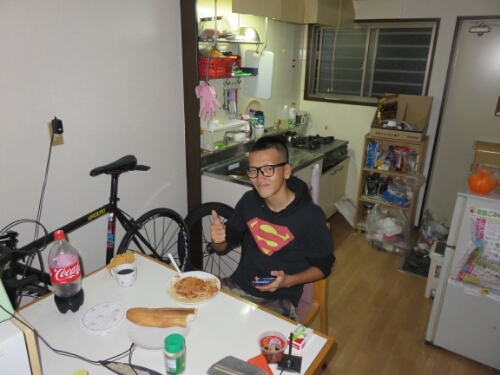 In order to say thanks I offered to cook Shoji some European food in the evening. This took the form of spaghetti bolognese as I didn’t want to risk anything too complicated. He seemed to enjoy it but that may just have been politeness. The whole day it rained and rained and rained. I was very thankful that I’d been lucky enough to meet someone as kind as Shoji. He really was incredibly generous to take a stranger in off the street and let him stay two nights. Thankfully by the evening the rain had stopped. This meant I was able to leave the next day and leave I did with Shoji riding with me to the road I needed. I was now heading for Kyoto one of Japan’s most famous cities; I was pretty excited about getting there. I was aiming to cover the 280km in two days. I was again a bit worried about accommodation as I’d not been able to find a warmshowers.org or couch surfing host yet. There were a lot of CS hosts in Kyoto and I figured I’d find one before I arrived. Leaving Fukuyama I was surprised how quickly the typhoon had blown over and how good the weather was. I made good time though the road I was following was often busier than I would have liked. 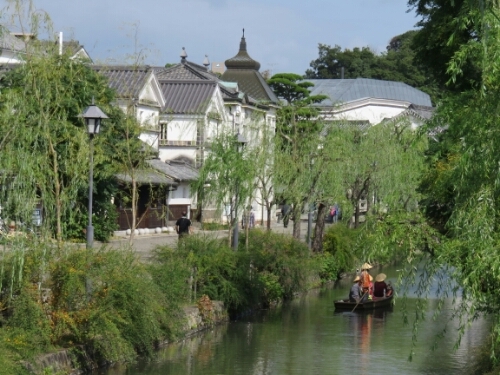 In the morning I stopped at Kurashiki for a quick ride round the well preserved streets of its tourist section. It was very nice there and peaceful after the busy roads. 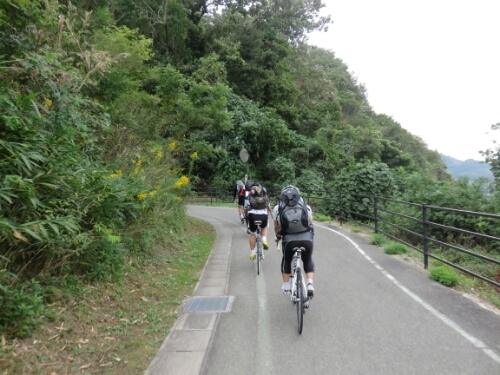 Sadly I was one again back on those roads as I cycled hard, eventually making it the 150km to Himeji. I arrived a bit later than expected in the environs of the city as I’d lost time finding a route I could cycle. Route 2 which I’d been following had turned into a highway and there was no obvious alternative for cyclists. When I’d finally found the right way it was almost dark and I camped on the first bit of grass with a bit of cover that I found. This happened to be on the edge of a cemetery which made me a bit nervous. Not because of ghosts but because I wasn’t sure if there were any taboos in Japan about camping so close to a burial ground. Thankfully no one disturbed me and I woke in the morning and got packed up and ready to head for Kyoto as quickly as possible. 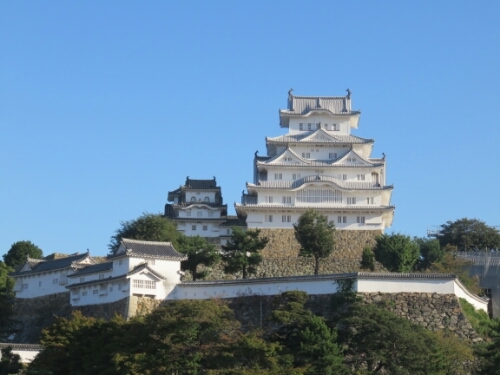 Before I left Himeji I made sure to ride round the wonderful Himeji-jo, the city’s castle. 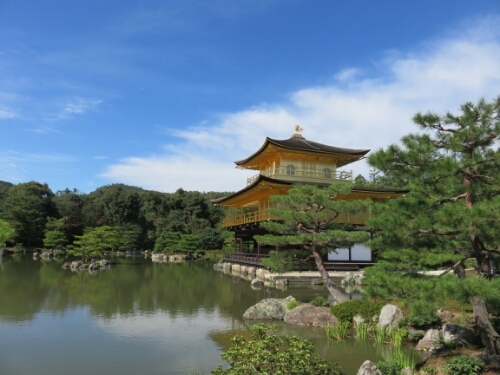 It’s one of my favourite sights in Japan and really spectacular. If you see one Japanese castle it should be thi. As I rode for Kyoto I was aware that I still hadn’t gotten an affirmative response from a CS host. I’d sent a few in parallel which is not something I normally like to do but as I wasn’t getting replies I gave it a try. The road I took was a bit of a back way as I wanted to avoid Osaka as I was sure it would be crazy with traffic. In the end I was very happy I made this decision as it allowed me to meet Joe and Noriko. This occurred when Joe pulled over a way ahead of me and flagged me down. My initial thoughts were ‘oh no what have I done?’, ‘did I drop something?’ or ‘am I going to be told to be careful again?’. In the end it was none of these, Joe was not in fact Japanese as I’d first thought, when my sunglasses get dirty I can’t see much! Instead he was very curious about the journey I was on as he already enjoyed long distance cycling and was considering going on a tour of some kind himself. After chatting for a while he asked where I was staying in Kyoto and I answered honestly that I didn’t know. 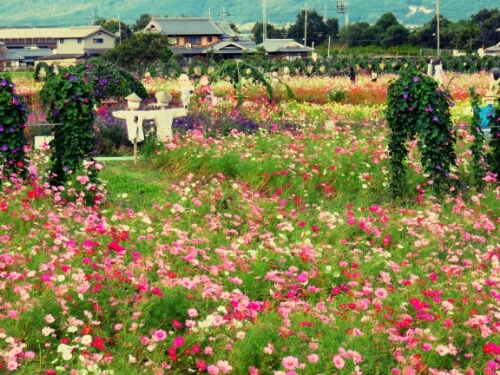 He then very kindly, after getting his wife Noriko’s agreement, offered to let me stay with them. 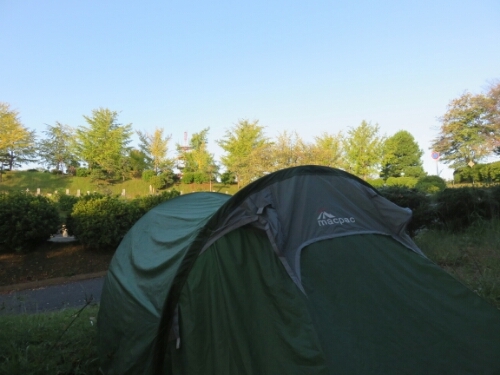 I was only too happy to agree, I’d not heard anything from the CS hosts and it was likely I’d be honing my urban camping skills otherwise. It was about four hours later when I finally arrived at their home and I woke Joe from a jet lag induced sleep as he was only recently back in Japan from England. I was then once more overwhelmed with kindness as I got a wonderful meal prepared by Noriko and a nice place to sleep in their lovely home. The next day Joe took the time to show me round the city which meant I got to see more of Kyoto than I would have blundering about by myself. You don't get shots like that on the Thames very often! That evening Noriko prepared another delicious dinner and both she and Joe made sure I ate till I was full, which is not at all easy to do these days. 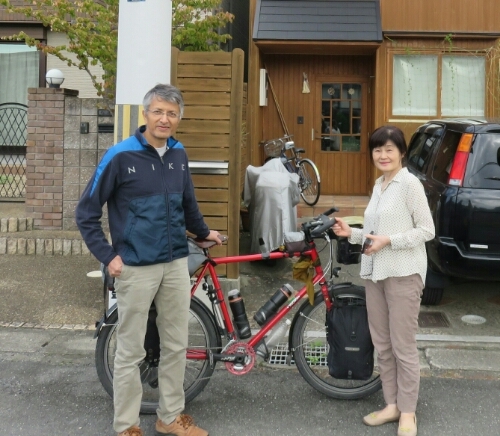 The next day I was going to be heading for Nara and it was time to bid Joe and Noriko farewell. Usually when I’ve said goodbye to people on this trip in similar situations it’s been with a heavy heart as I’ll probably never see them again. In this case it was easier as Joe and Noriko said they were often in London so I’d probably be able to meet them again.